AlphaX is an entirely new generation of crypto-currency based on Script using a complete Proof Of Stake (POS) network. The transactions made over Alpha-X's blockchain network are instant, and almost take place in real time, they are entirely anonymous and private and are also very secure. The whole operation takes place over the Alpha-X decentralized P2P network's self-governed architecture. Our intention is to make it as good as virtual cash (plastic cards) so that it can provide real-time liquidity and utility within the market. 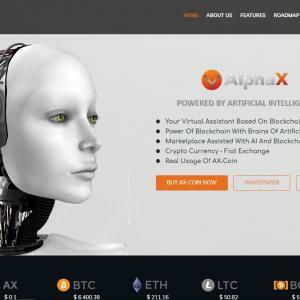 Alpha-X has its own AI system developed as X-intelligence a system which will assist the user in daily tasks and will understand and help users in daily tasks. Understanding private and public data for the user.